Over the course of the last twenty-four posts published on this blog, I’ve established beyond reasonable doubt that Derbyshire-born dentist Joseph Boden committed bigamy when he married my great-great-aunt Elizabeth Robb in 1841. And I’m fairly certain that Elizabeth herself became a bigamist in the following year, when she married piano teacher and music hall performer Edmund Vineer. This means that Vineer also committed bigamy when he went on to marry Sarah Eliza Plucknett in 1855. Most communities accepted these unions if they followed certain norms. The bigamist had to have a good reason to have left his or her spouse, had to have been honest with the second spouse, and had to be able to support multiple families. Within these parameters, neighbours and friends accepted illgeal marriages, following in a long tradition of self-marriage and self-divorce. Women sometimes left their first husbands because they were violent or because they needed to find somebody to support them and their children. Many individuals traded legality for happiness without losing sight of the concept or ritual of marriage and while continuing to use the labels ‘husband’ and ‘wife’. Subsequent unions were sometimes, but not always, more successful and happier than the first. In hundreds of novels, plays, and poems published in Victorian Great Britain, husbands or wives thought dead suddenly reappear to their newly remarried spouses. In the sensation fiction of Braddon and Collins, these bigamous revelations lead to bribery, arson, and murder, but the same plot operates in the canonical fiction of Charlotte Brontë, Dickens, Eliot, Thackeray, and Hardy. How does this help us to understand the actions of my ancestors and their partners? If bigamy was a means of escaping an unhappy marriage at a time when divorce was almost impossible, except for those with means or power, then how does that explain the behaviour of Joseph Boden, Elizabeth Robb and Edmund Vineer? Joseph Boden married Georgiana Westbrook towards the end of 1838, and then married Elizabeth Robb, just over two years later in February 1841, despite the fact that Georgiana was still alive and living in the couple’s home. Something must have gone wrong with that marriage very quickly and caused Joseph to leave it, since there is no evidence that he returned to Georgiana after his marriage to Elizabeth. Given Elizabeth’s own later bigamy, and the little we know of her married life with Joseph, it’s tempting to jump to the conclusion that Joseph was the problem: that he was simply a bad husband, and that Georgiana wanted rid of him. The fact that she was able to live on independent means without him implies that she didn’t need his income, as well as suggesting that, just possibly, he may have married Georgiana for her money. What we know of Joseph’s later life hints that he racked up debts, and that this may have been a reason both for Georgiana wanting him to leave, and for the separation from Elizabeth that happened towards the end of both their lives. As for Elizabeth, presumably she knew none of this when, as an innocent twenty-year-old, she married Joseph in 1841. However, if she is indeed the same Elizabeth Robb who bigamously married Edmund Vineer a year later, then (like Georgiana) she must have seen through Joseph quite quickly. Did she soon discover that he already had a wife, or was it some other aspect of his behaviour that disillusioned her? Why did Elizabeth marry Edmund Vineer? If it was to get away from Joseph, then why was she back with him nine years later, unless that was a respectable front to fool the census officials and other authorities in a censorious age? One imagines that this young music teacher, perhaps someone she had met before she married Joseph, provided a refuge when Elizabeth’s marriage to Joseph quickly turned sour. The big question here of course is: how much did Edmund know? Was he aware that Elizabeth was already married, but was sufficiently attracted to her to take her in and to provide a respectable veneer (if you’ll pardon the pun) to their cohabitation? Alternatively, was it his discovery of her bigamy that caused Edmund to disavow his marriage to Elizabeth, so that by 1851 he would be telling census officials that he had never been married? Or was it that, after the initial excitement of an illicit affair, the love between Edmund and Elizabeth also cooled? Or did Elizabeth simply decide to return to Joseph, responding to a call of marital duty, or family pressures, or a promise by her first husband to mend his ways? As for Edmund, he simply swept his marriage to Elizabeth under the carpet and moved away from London to start a new life. I doubt if he ever told his second wife Sarah Eliza about his entanglement with Elizabeth, and neither his bigamy, nor that of Elizabeth and Joseph, seem ever to have been exposed in the public prints. All of Edmund’s subsequent appearances in the press are reviews of his music hall appearances. As for Joseph, the original bigamist in this unhappy triangle, the only time he was mentioned in the newspapers was when he died. If the death in 1855 of Joseph Boden, the bigamous husband of my great-great-aunt Elizabeth Robb, wasn’t already a miserable enough affair (Joseph spent his last days as a lodger in a stranger’s house, suffering from consumption), it seems that the event had an even more tragic coda. In writing about Joseph’s death, I noted that it was registered by one Henry Lloyd, who lived at the same address in Fetter Lane, Holborn. At the time, I hadn’t managed to discover anything about Lloyd, beyond the fact that he wasn’t living in Fetter Lane at the time of either the 1851 or 1861 census. However, my fellow family historian Marcus Bateman has risen to the challenge and has managed to discover much more, and he has kindly shared his findings with me. It appears that Henry Lloyd was born in Edenham, Lincolnshire in 1811. Married to a woman named Ann, the 1851 census finds them living in the High Street in Stamford where Henry is working as a grocer, employing a shopman, an apprentice and two female servants. At some point in the next few years, Henry Lloyd moved to London (though it seems Ann Lloyd stayed in Stamford), where he became the proprietor of the Brunswick Coffee House at 100 Fetter Lane, the address where both he and Joseph Boden were living at the time of the latter’s death on 10th April 1855. (I’ve noted before that in 1861 this address would be home to William Chitty, also a coffee-house keeper.) So Joseph was a lodger in Henry’s house. It’s an odd story, especially as the witness admits that Lloyd kept ‘a very respectable coffee shop’ and ‘bore a very respectable character in the neighbourhood’. We also learn that Lloyd had been apprenticed to Thomas Sidney, who had been elected Lord Mayor of London in 1853, and seemed confident that the alderman would vouch for his honesty. One is tempted to dismiss the whole affair as one of mistaken identity by an elderly victim who was obviously the worse for drink at the time, especially as we know from other sources that the case was eventually dismissed for lack for evidence. However, the experience had grave consequences for Lloyd’s state of mind, and it seems that he never quite recovered from it. According to a report in The Stamford Mercury, the case affected business at the coffee house, which caused its proprietor to become ‘very melancholy’ and ‘in a desponding way’. One Monday towards the end of August 1855, the report continues, ‘not making his appearance at the usual time of opening the house, search was instituted, when the unfortunate man was found suspended by the neck in his apartment.’ The verdict at the ensuing inquest was ‘temporary insanity, and in that state deceased destroyed himself by hanging’. Henry Lloyd was buried at the parish church of St Andrew, Holborn on 23rd August 1855, just four months after he had registered the death of his lodger Joseph Boden. My great-great-aunt Elizabeth Boden née Robb lived for five years after the death of her bigamous husband Joseph in 1855. In the last post I described the circumstances of Joseph’s death from tuberculosis, in a boarding-house in Fetter Lane, Holborn, and suggested that the couple had almost certainly separated by this time. I also speculated that, following the effective end of her marriage to Joseph, Elizabeth may have gone to live with her older sister Matilda at 30 Gillingham Street in Pimlico. We know that Matilda moved to London at about this time, following the death of her employer Lady Frances Bassett of Tehidy Park, Cornwall. We also know that Elizabeth would be living with Matilda in Gillingham Street at the time of her death. Elizabeth Boden died on 11th January 1860. She was thirty-nine years old. Her sister Matilda, who registered the death three days later, was in attendance, but no medical personnel were present. The death certificate includes a couple of intriguing items of information. Firstly, Elizabeth is described as the widow of Joseph Woolley Boden, whose occupation is given as ‘dentist professed’. I wonder about the inclusion of that adjective ‘professed’. Is it simply an objective statement of Joseph’s qualifications for the job, or does it reflect some scepticism on Matilda’s part (reflecting what Elizabeth had told her, perhaps) about those qualifications? Did the sisters come to the conclusion that Joseph had deceived the world about his medical expertise, as well as his marital status? The other interesting point is the cause of death. This section of the certificate reads as follows: ‘Found dead in bed, probably resulting from fractured skull from a fall – 7 years since’. Knowing what we know about the Bodens’ marriage, the obvious question that comes to mind is: did she fall, or was she pushed? ‘7 years since’ dates the accident (if such it was) to 1853, two years before Joseph’s death. Was the fall simply an unfortunate accident, or did it result from a violent marital argument that precipitated Joseph Boden’s departure from the family home? Either way, it seems that the fall had a lasting impact on Elizabeth’s health, perhaps requiring constant care from her sister Matilda, and probably resulting in her eventual death. Elizabeth Boden was buried in Tower Hamlets Cemetery. This may seem an odd choice, until we recall that her older brother (my great-great-grandfather) William Robb had moved to Mile End in about 1855 and was now to all intents and purposes head of the family. He may have made the arrangements for Elizabeth’s burial. My theory that Matilda devoted herself to caring for her younger sister Elizabeth in the last few years of her life receives some support from the fact that, just over a month after the latter’s death, Matilda would finally marry. On 21st February 1860 Matilda Robb married Frederick King, a silk dyer and the son of a builder, at the impressive neoclassical church of St George, Hanover Square. The couple gave their address as Gillingham Street and both were described, discreetly, as of ‘full age’. Matilda was, in fact, just a few months away from her 55th birthday. Presumably the couple had been prevented from marrying before this date by Matilda’s duty of care for her younger sister. Frederick and Matilda King would only have a few years together as husband and wife. I haven’t found a record of Frederick’s death, but it must have occurred before Matilda’s death in 1870, since her death certificate describes her as his widow. Matilda died on 25th August 1870 at the age of 65, having suffered from diarrhoea for four months. In another instance of sibling care, Matilda spent her last days in the home of her brother William at 31 Turners Road in Mile End Old Town, which is where she died. Her sister-in-law, William’s second wife Marianne, who was probably effectively her carer, registered the death. In 1851 my possibly-bigamous great-great-aunt Elizabeth Robb and her almost-certainly -bigamous husband Joseph Boden were living in Lawrence Lane, off Cheapside in the City of London. Something must have happened in the next four years to drive the couple apart, since at the time of his death in 1855, Joseph was living elsewhere, and it appears that Elizabeth was not living with him. According to his death certificate, Joseph Boden died on 10th April 1855. He was 41 years old and his occupation is given as ‘dentist’. The cause of death was ‘phthisis pulmonalis’ or consumption of the lungs: in other words, tuberculosis. In Victorian London, it was mostly the poor who suffered from this disease, though consumption was still seen as the ‘romantic disease’ by the upper classes. Joseph’s address at the time of his death was 100 Fetter Lane, between Fleet Street and Holborn. The informant, who was present at the death, was one Henry Lloyd, of the same address, and the death was registered on 13th April. This fact alone leads me to believe that his wife Elizabeth was not with Joseph at the time of his death. I haven’t been able to find out much about Henry Lloyd. He certainly wasn’t living at 100 Fetter Lane at the time of the 1851 census. Then, the inhabitants were printer William B. Harris and his wife, together with three lodgers and a house servant. Nor would Lloyd be at that address in 1861, by which time it was the home (and presumably business premises) of coffee-house keeper William Chitty and his family, as well as four lodgers. The next-door neighbours were the same on both occasions, though: licensed victualler Thomas Adams and his wife and employees were at 101 Fetter Lane in both 1851 and 1861. By the latter date, the premises were described explicitly as the Vintner’s Arms (later renamed the Printer’s Devil, the pub finally closed in 2008). In other words, it looks as though Joseph Boden ended his life as a lodger in a stranger’s house, rather like his father-in-law, my great-great-great-grandfather Charles Robb (see this post). Since we know his wife Elizabeth was still alive at the time, the only explanation can be that the couple had separated. As for Elizabeth, we have no way of knowing if she was still at the Bodens’ former home in Lawrence Lane, or whether she had already moved into her sister Matilda’s house in Gillingham Street, Pimlico. All we can know for sure is that Elizabeth Boden would be there at the time of her own death, five years after that of her husband. I’m trying to piece together the story of the final years of Joseph and Elizabeth Boden. In doing so, it’s important to understand the part played in the story by Elizabeth’s older sister Matilda. As I noted in an earlier post, Matilda Robb was the oldest surviving child of my great-great-great-grandparents, Charles and Margaret Robb. Born in 1805 in Aberdeen, she may not have followed her parents and siblings south to Yorkshire, and then to London. Instead, at some point, Matilda moved to Cornwall to take up a post as servant in the household of Lady Frances Bassett, a baroness and heir to a tin mining fortune, who lived at Tehidy Park in Illogan, near Redruth. The first official record we have for Matilda after her baptism is the 1841 census, by which time she was 36 years old. It’s impossible to know whether Matilda had been working for Lady Frances for some years, or whether she had been in service elsewhere first and came to Tehidy Park later. What is clear is that a life of service seems to have ruled out any possibility of marriage for Matilda. When the national census was taken on 6th June 1841, Matilda was with her employer Baroness Bassett, age 60, and a Mary Bassett (her sister?) aged 70, in Devizes, Wiltshire. They seem to have been staying at an inn or hotel and were probably en route to London, or on their way home to Cornwall. Matilda is described in the census record simply as a servant, but by the time of the 1851 census, when she was back at Tehidy Park with the baroness and fourteen other servants, Matilda would occupy the important post of ‘lady’s maid’, or personal assistant to the lady of the house. To my Maid Matilda Robb an annuity of one hundred pounds during her life such annuities respectively to be paid by half yearly payments and to commence respectively from my death and proportionable parts thereof respectively to be paid up to the several death of the respective annuitants. To the said Matilda Robb all my wearing apparel. While most of Lady Bassett’s servants received an annuity of fifty pounds: only Matilda and the housekeeper were fortunate enough to be left one hundred pounds each: a not insignificant amount in the 1850s. The baroness’ clothing collection must have been worth something too, assuming that Matilda didn’t wish to wear it herself, or keep it for sentimental reasons. Lady Frances Bassett died in 1855 and her will was proven in London on 11th June of that year. Her employer’s death would have left Matilda both jobless and homeless, though with some money to live on as an ‘annuitant’. We don’t know whether Matilda left immediately for London, where the surviving members of her family were living, but it seems likely. It’s also unclear whether she moved immediately into the house at 30 Gillingham Street, Pimlico, off Vauxhall Bridge Road and near present-day Victoria station, where she would be living a few years later. There are good reasons for believing that Elizabeth Boden née Robb went to live with her sister Matilda in Gillingham Street after the death of her husband Joseph, or perhaps before. In order to gain a better understanding of Elizabeth’s movements, we need to examine the circumstances of Joseph’s death, which will be the subject of the next post. We know very little about the lives of Joseph Boden and Elizabeth Robb in the early years of their marriage (if we set aside for now the possibility that Elizabeth committed bigamy by marrying Edmund Vineer a year after she married Joseph). Despite my best efforts, I’ve been unable to find either Joseph or Elizabeth in the 1841 census, which was taken on 6th June, just over three months after their wedding at St Martin-in-the-Fields. It’s possible that this is because the records for the area where they would be living ten years later are missing. The 1851 census is thus the first definite record we have for the couple after their marriage, and we can’t know for certain that they were living at the same address in the preceding years. On 30th March 1851 Joseph Boden, a 37-year-old dentist, born in Morley, Derbyshire, and his Yorkshire-born wife Elizabeth, aged 30, were living in Lawrence Lane, just off Cheapside, in the parish of St Mary-le-Bow in the City of London. Living with them is 18-year-old house servant Elizabeth Earl, originally from the parish of St Pancras. So is this a picture of settled Victorian middle-class family life? It might have been, if we weren’t fairly certain that Joseph had committed bigamy when he married Elizabeth, and if we didn’t suspect that Elizabeth had her revenge when she took a second husband shortly afterwards. Even without these facts, we might wonder why the Bodens were childless after ten years of marriage, particularly given the normal birthrate in Victorian families. But I’ve found no record of any children born to the couple. In the last post, I wrote about the marriage of Joseph’s fellow dentist Charles Hobbs and Harriet Westbrook, the sister of Joseph’s first wife Georgiana. Despite the apparent problems in that relationship, the couple produced six children in their first thirteen years together. Of course, there may have been medical reasons why the Bodens were unable to have children. But given what we know about the nature of their marriage, one suspects that there might have been other reasons. Despite the fact that Joseph and Elizabeth were living together in 1851, it’s difficult to imagine that the intervening ten years had been trouble-free. Were they now reconciled after a time apart? Had Elizabeth discovered Joseph’s deception, or was it still a secret from her? Was their cohabitation a sign of a genuine relationship, or a fiction for official purposes? One would love to travel back in time and be a fly on the wall in Lawrence Lane on that evening in March 1851 and assess the situation for oneself. In the ten years since Elizabeth’s marriage to Joseph, there had been some important changes in her family. Elizabeth’s mother, and my great-great-great-grandmother, Margaret Robb had died on 1st December 1843 at the age of 62 and had been buried six days later at St-Martin-in-the-Fields. In March 1844 Elizabeth’s brother John, a parliamentary clerk, had married Mary Ann Downes in Lambeth. They had one son, born in 1844 and named Charles Edward Stuart Robb after his grandfather, who sadly died in infancy, and a daughter, Mary Ann, who was born in 1847. 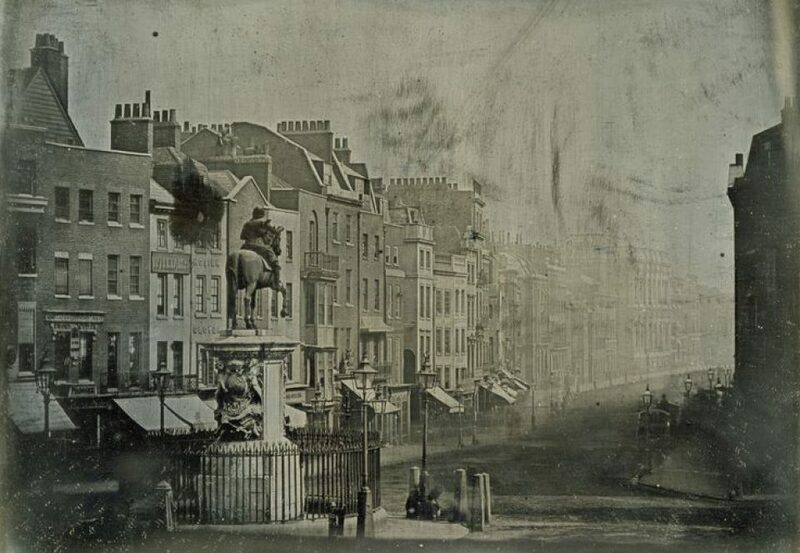 Another brother, George William, also a clerk, died from influenza and bronchities at his home in Villiers Street, off the Strand in 1847; he was 30 years old. A third brother, William (my great-great-grandfather) lost his wife Fanny to pneumonia shortly after the birth of their son Charles Edward (my great-grandfather) early in 1851. Elizabeth’s older sister Matilda was still in Cornwall, working as a lady’s maid, in 1851. The death of his wife seems to have led to Charles Robb, Elizabeth’s father, leaving Charing Cross and moving across the river to Lambeth, perhaps to be near his son John. Sadly, none of his adult children seem to have had the will or the means to provide him with a home. As a result Charles seems to have spent his final years in relative poverty, sharing a house with four families, including the large family of portable water closet maker William Matthews, in Tenison Road, off York Road, and close to what would become Waterloo Station. Shortly before his death in June 1853 Charles Robb composed his last will and testament. He seems to have had precious little property for his children to inherit: a few valued possessions as well as his clothes and household furniture, to be sold to pay for his funeral expenses, and any money left over to be divided equally between his four surviving children. One clause in the will is of particular interest for our story. Charles Robb declares that his daughter Elizabeth’s share is to be to be ‘free from the debts or control of her husband’. Now, this may have been a standard legal precaution. Alternatively, it may say something about Joseph Boden’s financial situation and the state of his relationship with Elizabeth. Charles Robb’s will was witnessed by William Matthews and his wife Elizabeth, and it was the latter who signed the death certificate when Charles died on 10th June at the age of 73. The cause of death is given as ‘old age’ but there is also mention of ‘paralysis 6 years’, suggesting a painful decline in his final years. My great-great-grandfather was buried at the church of St John, Waterloo Road, in Lambeth. By the time the next national census was taken in 1861, both Joseph and Elizabeth Boden would also be dead. Tracing the final years of their lives requires us to examine the role played by Elizabeth’s sister Matilda, who will be introduced in the next post. It seems more than coincidental that the sisters Georgiana and Cordelia Harriet Westbrook both married young dentists, at the same church and within a year of each other, and there is every reason to believe that their husbands Joseph Boden and Charles Hobbs were colleagues or friends. The marriage of Charles Hobbs and Cordelia Harriet Westbrook seems to have been as troubled as Joseph Boden’s two marriages, though I’ve yet to find any actual evidence of bigamy in this case. I thought it might be useful to take a closer look at the Hobbs-Westbrook relationship, to see whether it can throw any fresh light on this intriguing story of multiple marital deceptions. Cordelia Harriet Isabella Westbrook, often known simply as Harriet, was born on 3rd July 1812 and baptised on 13th August at the parish church of St Marylebone. She was the second, but first surviving, daughter of Thomas Westbrook and Elizabeth Molloy, who had been married at the same church four years earlier. Their first child, Mary Ann Isabella, had been born in June 1810 and christened at St Marylebone, but died five months later. At the time, the Westbrooks were living in Cow Cross Street, Holborn, but they were back in Marylebone for the birth of Cordelia Harriet’s younger sister Georgiana in April 1816. The Westbrooks had no other children. Thomas had definitely died by the time of Georgiana’s marriage to Joseph Boden in 1838, and I can find no trace of Elizabeth in the 1841 census, so it’s possible that she was also dead by then. In an earlier post, I speculated that Harriet and Georgiana may have received a comfortable inheritance on the death of their father (Georgiana was described as being of independent means in the 1841 census), and that this may have made them an attractive ‘catch’ for Charles Hobbs and Joseph Boden, a pair of (impecunious?) young dentists. Alternatively, their father’s death may simply have increased the pressure on the two sisters to find husbands to provide for them. We can only speculate as to how Harriet and Georgiana met their future husbands. Unfortunately, we don’t know exactly where in the parish of St Marylebone the Westbrooks were living in the 1830s, but it probably wasn’t far from the area north of Oxford Street where Charles Hobbs and Joseph Boden practised dentistry, whether separately or together. After his marriage to Harriet, Hobbs would be living in John Street, while Boden gave his address as Gresse Street at the time of his marriage to Georgiana and Great Castle Street when he married Elizabeth Robb. Harriet would have been twenty-four years old when she married Charles Hobbs on 28th March 1837. Charles was somewhat younger: if the 1841 census is to be believed, he was about twenty-two at the time. Like her sister Georgiana a year and a half later, Harriet was married at the old church of St Pancras. This may suggest that the Westbrook sisters had moved into this parish, which at the time encompassed the area around Tottenham Court Road and Oxford Street. We have to wait until the births of their children to discover more about Charles and Harriet Hobbs’ circumstances. Their first child, Elizabeth Mary, was born on 18th October 1837, just seven months after the wedding (which may or may not be significant), and christened on 15th November at the church of St Botolph, Bishopsgate. A second child, Charles George, was born on 5th May 1839 and baptised nine months later at the same church. This is the first record to provide us with information about Charles’ occupation (‘dentist’) and about the family’s address, though at this stage all we know is that it was ‘Marylebone’. In April 1841 Charles and Harriet Hobbs were back at St Pancras old church for the christening of their next child, Maria Georgiana, who had been born on 25th January. This record is much clearer about their address: they are now living in John Street, north of Oxford Street. Charles is again described as a dentist. The Hobbs family were still at John Street in June of that year, when the national census was taken. Elizabeth is now 4 years old, Charles junior 2, and Georgiana (‘Maria’ has been dropped) 4 months. Interestingly, Charles senior is described in this record as an ‘assistant dentist’, which prompts the question: assistant to whom? Could it have been his bigamous brother-in-law Joseph Boden? The census record might provide a small clue as to Charles’ origins: he is said to have been born out of county (i.e. not in Middlesex), but then so were Elizabeth and Charles junior: they were born in the City of London. After 1841, the movements of the Hobbs family become more erratic. According to later census records, their son Henry Richard was born in Dalston in 1844, their daughter Susan in Soho in 1848, and another daughter Emily in 1850. It’s possible that Emily was born in Tavistock Court, Covent Garden, which is where the family would be living at the time of the 1851 census. The census record finds Harriet with her six children, aged between 7 months and 12 years, together with a visitor by the name of Maria Brown and her daughter (?) Lydia, both of them described as upholsterers. However, Charles Hobbs is nowhere to be seen. Harriet is said to be head of the household, though she is still described as ‘married’, so presumably her husband was still alive, though (temporarily?) absent. Elizabeth Mary Hobbs married printer and compositor George Bateman in 1860, but I’ve yet to find a record of their marriage. The census of the following year finds Harriet Hobbs living at 116 Devonshire Street, between Marylebone High Street and Great Portland Street, with four unmarried children. With her are Charles junior, 20, who is working as a solicitor’s general clerk; Maria (Georgiana), 18, described as a ‘theatrical’; Henry, 17, a shirt cutter; and Susan, 13, who is still a scholar. There is no mention of Emily, who would have been 10 or 11 if she survived. Neither is there any sign of Harriet’s husband Charles, though once again she is said to be still married. The last record we have for Harriet is from 1871, by which time she is living with her son Henry, now a woollen warehouseman’s assistant, and his wife Amelia and two young children, in Clifton Grove, Camberwell. The census record describes her as a widow, so I assume that Charles Hobbs had died sometime between 1861 and 1871. I’m not sure when Harriet died, but she was no longer with Henry in 1881, when he and his family were living in West Ham, or in 1891, when they were back in Camberwell. How are we to explain Charles Hobbs’ absence from the family home at the time of the 1851 and 1861 censuses? Is there an innocent explanation: perhaps he just happened to be working away from home, or perhaps visiting relatives, on each occasion? But then why can’t I find anyone matching his details elsewhere in the census records for those years? Perhaps Hobbs was in prison, or fleeing justice. I’ve come to the conclusion that there is circumstantial, though not conclusive evidence, that the Elizabeth Robb who married Edmund Vineer in 1842 was my great-great-aunt, and if this turns out to be the case, then she was committing bigamy by doing so. As I noted in the last post, it’s unclear whether Edmund was aware of Elizabeth’s married status at the time of their wedding. However, it’s apparent that by 1851, nine years after he had married Elizabeth at the parish church in Paddington, Edmund wanted nothing more to do with the marriage. Edmund’s description of himself as ‘unmarried’ in the census record of 1851 is curious. By this stage, he was back living with his widowed mother Ann and his younger siblings in Islington. If the Elizabeth Robb that he married in 1842 was indeed my great-great-aunt, then we know that she was still alive at this date, so Edmund was still legally married. But even if Elizabeth turns out to be a different person with the same name, and she had died in the meantime, then surely Edmund would have described himself as a widower, indicated by a ‘W’ in the relevant column of the census record? One can only conclude that Edmund Vineer described himself as ‘unmarried’ in order to cover over all traces of his marriage to Elizabeth Robb. The 1851 census was taken in March of that year. In November Edmund Vineer was still appearing at the Surrey Music Hall in Southwark, but by September 1852 he was directing the orchestra at Rendle’s Concert Hall in Portsea, Portsmouth, which was also the home town of Sarah Eliza Plucknett, whom he would marry three years later. It’s possible that Edmund had already met Sarah Eliza, and may even have been engaged to her, when the 1851 census was taken, giving him a powerful motive for describing himself as ‘unmarried’. Alverstoke, Hampshire, where Edmund Vineer and Sarah Eliza Plucknett were married in 1855. As in the case of Elizabeth Robb, then, the evidence for Edmund Vineer being a bigamist is circumstantial rather than conclusive. If we could prove that the Elizabeth Robb whom he married in 1842 was not my ancestor, and we could also find evidence that she had died before 1855, then we could be certain that Edmund did not commit bigamy when he married Sarah Eliza Plucknett at Alverstoke, near Gosport in Hampshire. If not, then some time in the last quarter of 1855 Edmund John Vineer made himself a bigamist. Ironically, just a few months before, my great-great-aunt Elizabeth Robb had ceased to be a bigamist, when her (first) husband Joseph Boden died. The last post established beyond reasonable doubt that Derbyshire-born dentist Joseph Boden committed bigamy when he married my great-great-aunt Elizabeth Robb in February 1841. But what of Elizabeth herself? Did she also become a bigamist a year later, by marrying piano teacher and music hall performer Edmund Vineer? What is the evidence that the Elizabeth Robb who married Edmund Vineer in February 1842 was my already-married ancestor? To be honest, I don’t think it’s quite as conclusive as the evidence against Joseph Boden. As mentioned in a previous post, the parish register at the church of St Mary, Paddington, states that the Elizabeth Robb who married Edmund Vineer had a father named Charles and that he was a ‘gentleman’. These facts were undoubtedly true of my great-great-aunt, and in fact her father (my great-great-great-grandfather) was described in those terms at the time of Elizabeth’s wedding to Joseph Boden a year earlier. On the other hand, the statement that Edmund Vineer’s bride was, like him, a minor, was certainly not true of ‘my’ Elizabeth Robb: she had celebrated her twenty-first birthday in the previous June. This minor fib might be given, but it does raise the question as to who validated the marriage of these two apparent ‘minors’? As for the claim in the register that Elizabeth was living in Bayswater, if this were a bigamous marriage, then surely the guilty party would want to disguise her true address? I suspect that Joseph Boden did this when he married Elizabeth and gave Great Castle Street as his address, rather than the house in Gresse Street where he and Georgiana Boden had set up home. (Unless, of course, he and Georgiana had separated, or she had made him leave, by then?) And we’ve already expressed suspicions that Edmund might not have been compeletely truthful when he gave his address as Salem Gardens, also in Bayswater. So, these negative factors – Elizabeth Robb’s age and her address – don’t necessarily rule out the possibility of this being the same person who had married Joseph Boden a year earlier. At the same time, the name and status of Elizabeth’s father are circumstantial rather than decisive factors in support of that possibility. But, as I’ve noted before, these circumstantial factors are given additional weight by the absence of another Elizabeth Robb with a father named Charles living in London, and certainly in Bayswater, at this time. Another piece of circumstantial evidence to weigh in the balance is the fact that the marriage of Edmund Vineer and Elizabeth Robb appears not have lasted very long. By 1851, Edmund was claiming to be unmarried. I’ll explore the claim that Edmund Vineer was a bigamist in the next post. For now, the brevity of his marriage to Elizabeth Robb makes me wonder why she entered into this arrangement in the first place. If this was indeed my great-great-aunt, then at the very least her decision to marry Edmund Vineer suggests that she was unhappy in her marriage to Joseph Boden. Did Elizabeth find out that Joseph was already married, and did that discovery prompt her to seek revenge in a bigamous marriage of her own? Or was Edmund Vineer simply the lover she ran to when her marriage to Joseph turned sour? If so, how did she meet him: perhaps he was her music teacher? Did she tell Edmund that she was already married, or did he discover this later and then cast her off, attempting to pretend that this illegal marriage had never happened? In writing the last few posts about the four marriages at the centre of our story, I’ve realised that what we have here is actually a case of triple rather than double bigamy. Firstly, Joseph Boden committed bigamy by marrying my great-great-aunt Elizabeth Robb in 1841, since he was already married to Georgiana Westbrook. Secondly, Elizabeth committed bigamy in 1842 when she married Edmund Vineer, though she was still married to Joseph Boden. And thirdly, Edmund Vineer committed bigamy in 1855 when he married Sarah Eliza Plucknett, since he was still married to Elizabeth. Of course, I’m writing as if the case for these individuals being bigamists were all done and dusted. But what if I’m misinterpreting the evidence? Could there be another explanation for the curious series of events that I’ve described in previous posts? In the next few posts, I want to take a closer look at the evidence for Joseph, Elizabeth and Edmund being bigamists. Let’s start with Joseph Boden. It seems fairly certain that the Joseph Boden who married Elizabeth Robb in February 1841 was the same man who had married Georgiana Westbrook in December 1838. For that not to be the case, we would have to believe that there were two dentists going by the name of Joseph Boden, both living in the Oxford Street area of London, and both with fathers named John who were farmers, in the late 1830s and early 1840s. Given that this is highly unlikely, I suggest we proceed on the basis that this was one and the same person. Having established that fact, we need to find evidence that Joseph was actually committing bigamy when he married Elizabeth Robb. Only one thing would exonerate him from this charge, and that is proof that his first wife, Georgiana, had died in the interim. However, there is one crucial piece of evidence that contradicts this possibility, and on that evidence the whole case against Joseph Boden currently rests. As I’ve mentioned before, a nationwide census was taken on 6th June 1841, nearly four months after Joseph Boden had married Elizabeth Robb. When Joseph married Georgiana Westbrook in December 1838, both bride and groom gave their address as 27 Gresse Street, off Rathbone Place and just to the north of Oxford Street. This was close to Great Castle Street, which Joseph gave as his address when he married Elizabeth Robb, and not far from John Street, where Georgiana’s sister Harriet Westbrook and her husband, another dentist named Charles Hobbs, were living in 1841. The 1841 census for Gresse Street includes an entry for ‘Georgina Boden’, said to be aged 25, born in the county (i.e. Middlesex) and of ‘independent’ means. I think we can overlook the absent ‘a’ in Georgiana’s Christian name. How many Georgina or Georgiana Bodens were there in London, or anywhere else for that matter, at this time? The 1841 census was notorious for rounding ages up or down to the nearest 0 or 5, but Georgiana Boden née Westbrook actually was 25 at the time of the census, having been born in March 1816. And we know that she was born in Middlesex: in nearby Marylebone, to be precise. Finally, the address would appear to be the clincher. Even if there were another Georgi(a)na Boden of this age living in London at this time, wouldn’t it be an incredible coincidence to find her living in the very street that Joseph and Georgiana had given as their address when they married a little more than two years earlier? So, as far as I’m concerned, the evidence that Joseph Boden became a bigamist when he married my ancestor Elizabeth Robb is all but conclusive. In fact, the 1841 census record prompts me, having established this fact beyond reasonable doubt, to move on to the next step, and to wonder why Joseph did what he did. That ‘independent’ status ascribed to Georgiana is intriguing. It seems unlikely that she was living on income supplied by Joseph. Instead, I wonder if Georgiana and her sister Harriet, as the only two surviving children of Thomas Westbrook, who had died in 1835, were the heirs to his estate? All we know of Thomas’ occupation is that he was a ‘trader’. But what if he were a wealthy one, and what if he left everything to his two daughters? Could this have been the motive for two struggling young dentists, friends or colleagues perhaps, to have ensnared the two sisters in marriage, in quick succession (Charles Hobbs married Harriet in 1837, Joseph Boden married Georgiana in 1838)? Without further proof, this can only be speculation, and perhaps it’s more the stuff of late Regency fiction than early Victorian fact. However, it’s entirely possible that the marriage of Joseph and Georgiana ran into difficulties (as that of Charles and Harriet seems to have done a few years later), prompting Joseph to depart (or Georgiana to force him out), leaving his young wife to fall back on the money she had inherited from her late father. Frustratingly, I’ve been unable to discover any trace of Georgiana after the 1841 census. She doesn’t appear in any later census records, nor can I find any record of her death, emigration or later marriage. But the search goes on.